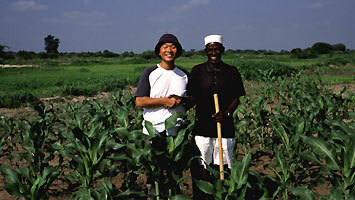 In April 2003, the Tanzania Field Station (TFS) was established by renting a private house in Dar es Salaam in Tanzania. In FY2003, a total of 16 people from ASAFAS used the TFS, including five ASAFAS members (KAKEYA Makoto, OHTA Itaru, IKENO Jun, ITANI Juichi, and ARAKI Minako) and 11 graduate students (NINDI, S. J., HASEGAWA Tatsuo, KONDO Fumi, MHANDO, D. G., OGAWA Sayaka, KUROSAKI Ryugo, SEKO Sayaka, KATO Futoshi, KAWANISHI Yoichi, YATSUKA Haruna and MIZOUCHI Katsuyuki). The following are the activities subsidized by the 21st Century COE Program. October - December, 2003: KONDO Fumi; "Agro-ecological Study on the Development of Indigenous Cropping System in the Southern Highlands of Tanzania"
December 2003 - March 2004: MHANDO, D. G.; "Farmer's Coping Strategies under the Changes of Coffee Marketing System after Economic Liberalization :The Case of Mbinga District, Tanzania"
February 2004: HASEGAWA Tatsuo;"Changes of the Management and Strategy of Agro-Pastoral Livelihoods in Gogo Society, Central Tanzania"
The Tanzania Field Station (TFS) is equipped with a seminar room and accommodations, and is used also as a center for communication network and for data analysis and sample processing, storing research materials and preparing presentations. Seminar room, study rooms (4), living room, garage, warehouse and others. Communication equipment (telephone, satellite telephone, mobile phones), laptop computer, printer, liquid-crystal projector, set of measuring equipment, digital camera, tent, sleeping bags, etc. The TFS has a full-time watchman and security service by a private security firm. To conduct a survey in Tanzania, researchers must stay in Dar es Salaam for at least two weeks to obtain their research permit and residence permit. The TFS is effectively used as a safe accommodation on such occasions. At the TFS, open seminars are organized with the participation of resident researchers in Tanzania, researchers from other institutions and dispatched ASFFAS students. 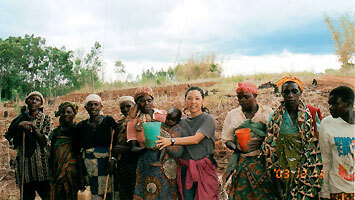 At the first TFS seminar was held in November 2003, ASAFAS students, SEKO Sayaka (enrolled in FY2001) and KAWANISHI Yoichi (enrolled in FY2002), presented progress reports on their fieldworks, and in the second seminar in February 2004, another ASAFAS student, HASEGAWA Tatsuo (enrolled in FY1999), presented the findings of his research. The seminar offers participants an opportunity to exchange multidimensional opinions from researchers of different disciplines and people having various information of Tanzania, and studies can be deepened in an interdisciplinary manner. Further, having the opportunity to make a presentation at a seminar on the way of or at the end of long fieldwork helps researchers to objectively re-grasp the research and to reconfirm the direction of the study. The abstracts of the presentations will be published on the website. Center for African Area Studies and the SUA Centre for Sustainable Rural Development (SCSRD) have a research agreement and have maintained a close working relationship. The two institutions are in agreement to promote collaboration research in area studies and rural development. Many ASAFAS students have been supported in their research activities by SCSRD researcher counterparts. At the regular SCSRD seminar in FY2003, S. Nindi, D. Mhando and KONDO Fumi reported on their research plans and progress.